10 years and eight months ago, Dr. Barry Culhane, executive assistant to the president, was presented with an enormous task. "[Destler] was on the job for four months, and he came to me and he said, 'I have a really good idea, big plan for you,'" Culhane said. "He — very casually — says, 'You know, I'd really like to get 30,000 people on campus to see everything that our wonderful students, faculty and staff do together.'" Imagine RIT was President Bill Destler's brainchild. Culhane, the festival's chairman, brought it to life with the help of many people. "With eight months to go and a hodgepodge lodge of volunteers ... we started working on it day and night," Culhane said. "Literally day and night the first year." They decided to call the festival "Imagine RIT." It wasn't easy. 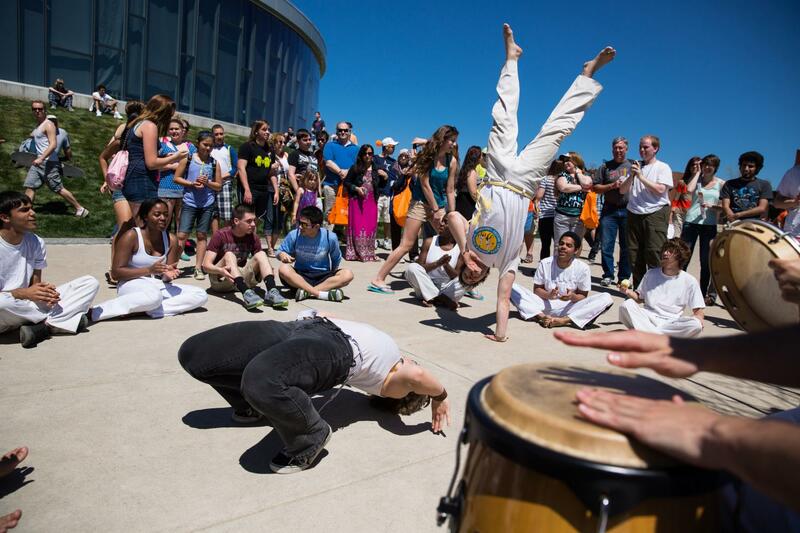 Pulling together an unprecedented campus-wide festival in eight months was a challenge, but the campus rose to it. 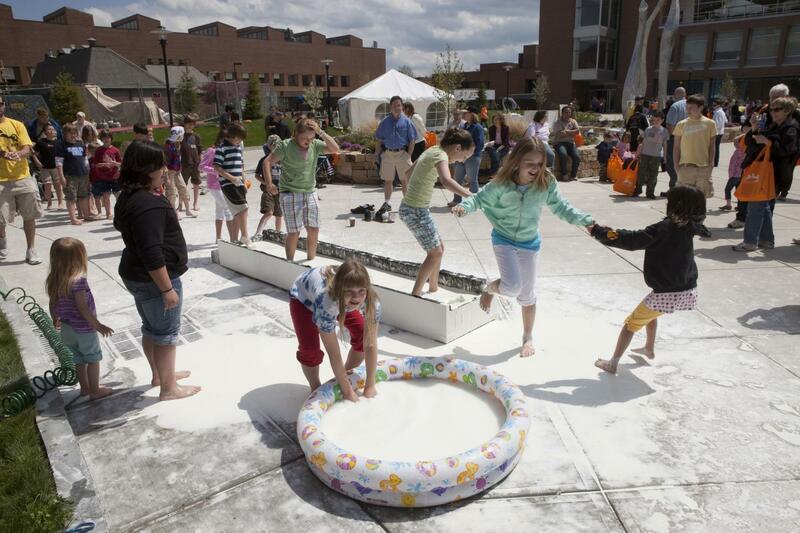 On May 3, 2008, some 17,500 visitors came to campus to see what RIT had to offer. Immediately after, the committee debriefed what went wrong and what went right, and to prepare for the next year. Reporter covered the event and had a lot of positive feedback. However, Max Wunderlich, then a fourth year Information Technology major, reportedly remarked that "while he enjoyed the festival, he would not like to see it annually, as a year's worth of innovation might not be adequate for the festival." He would be proven wrong. The following years were even more successful. In 2009, the festival drew in 25,000 visitors. The next year, President Destler's dream was achieved: 32,000 visitors saw the wonderful things happening at RIT. Every year since, according to Culhane, more than 33,000 people have attended. The organizers are happy with that number. "We really don't care to have 50,000," said Culhane. "Because we would have lines and things that people would really be annoyed about." From the beginning, President Destler and his wife, Dr. Rebecca Johnson, have hosted a competition for students called "Destler's Challenge." In its early years, the challenges focused on e-vehicles, a special interest of Destler's. Hot Wheelz, an all-female Formula SAE racing team, began as a way for female engineers to work together on this challenge. Since the challenge has moved on to other fields, Hot Wheelz transitioned to be the only all-female Formula SAE team in the nation. Caitlin Babul, fifth year Mechanical Engineering major and chief electrical engineer for Hot Wheelz, explained that Hot Wheelz usually teams up with the other racing groups on campus to unveil their vehicles at Imagine RIT. She recalled an unveiling that she attended last year. "There was just a huge crowd of people circled around ... when the cars started coming out, there was just a loud roar from the crowd," she said. "It was just a really proud moment for us." Scott Williamson, second year Electrical Engineer major and current Imagine RIT coordinator for Engineering House (E-House), exhibited last year. E-House, a Special Interest House on campus, has participated intermittently since the beginning according to Williamson. In 2016, E-House had four projects that lasted for the entirety of the day. "We also had a Ruben's tube, which turned into a small pipe bomb," said Williamson. A Ruben's tube is a gas tube which produces waves of fire through holes in the top when music is played through it. "When it did work it was awesome." One of their projects was a theremin, an early electrical musical instrument that plays music when it detects motion. It was designed into a "Star Wars" droid. "I do remember Destler absolutely loving the theremin that we built," Williamson recalled. "He was sitting there playing with it." 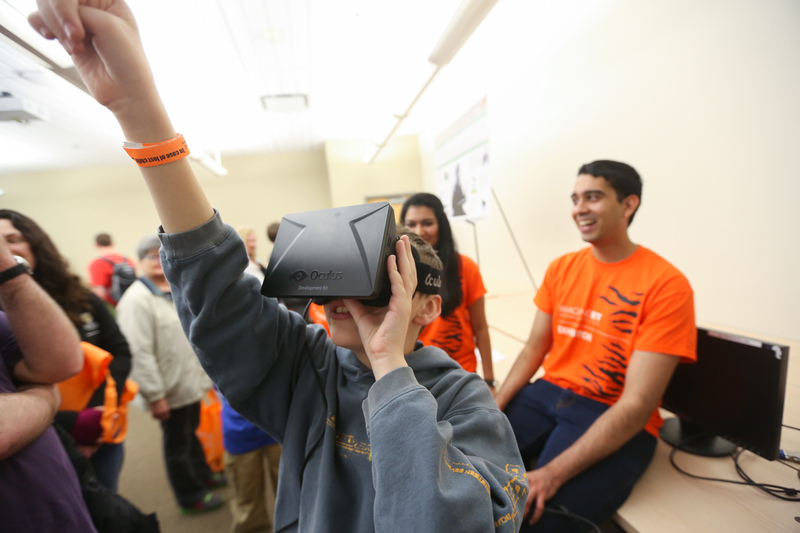 Imagine RIT is about showcasing all that RIT has to offer, and that includes more than just engineering and sciences. Liberal Arts students showcase their work and the various performance groups on campus will also give performances throughout the day. "I think it's really nice for people walking around," said Jenna Rahrle, second year Public Policy and Political Science double major and music director of Proof of Purchase (POP), a co-ed a capella group. "They're seeing all of these different really cool technology tables and then they can go through Infinity Quad and hear people performing." Rahrle remembers last year's Imagine RIT fondly. "We were performing 'Shut Up and Dance' by Walk the Moon and one girl in the audience got up on the stage with us and started dancing with the soloist," she said. "It was really fun." This year, Imagine RIT takes place on May 6; 3,500 exhibitors, including Babul, Williamson and Rahrle will showcase over 400 projects. Exhibitors, interpreters, support staff and 500-600 volunteers will gather together to pull off another Imagine RIT. Rahrle will be performing with the rest of POP at 2 p.m. in Infinity Quad in the "Think Tank" zone. While they haven't finalized their set list, POP's current repertoire includes Delta Rae, Walk the Moon, Ellie Goulding and Muse. Visitors can expect to hear at least one song they recognize. For regular performances, POP puts together choreography, but they focus on the vocals for Imagine RIT. Preparation for performances callf for 7 hours of vocal rehearsal a week, but the group looks forward to performing. "It's really fun and a little more laid back," said Rahrle. "The general, positive upbeat energy of Imagine is a really nice environment." "The general, positive upbeat energy of Imagine is a really nice environment." The Hot Wheelz team will unveil their car with the other RIT motorsports teams outside in the "RIT Central" zone from 11 a.m. to 12 p.m. The rest of the day they will be in the Gordon Field House with their car. "My favorite part [of presenting] is interacting with the community and getting to talk with them and share what you're passionate about with them and hopefully, go spark some interest or passion in them as well," said Babul. "Racecars are cool. People like racecars. They like to see them go fast." The Formula SAE competition that Hot Wheelz participates in is the week before Imagine RIT. They get back on May 5. Luckily, this means that they already have a fully assembled car, built from scratch. The only preparation specific to Imagine RIT is the creation of materials and posters for presentation. Babul will also be presenting with Pi Tau Sigma, an honorary engineering society. Their exhibit is "Six Simple Machines," and will be located in Infinity Quad. Groups like E-House, who build projects specifically for Imagine RIT, often run into crunch time the week before. Williamson manages all of the projects for E-House and coordinates with already-overworked students to get everything in on time. "It tends to get stressful that whole last week," Williamson said. "We're about a month away at this point and some people are just starting their projects." "The last two-week block, they've started pulling all-nighters," Williamson said about last year. "The last two-week block, they've started pulling all-nighters." The sheer breadth and depth of student groups who present at Imagine RIT really displays all that our school has to offer. Many students are willing to step away from their studies at a crucial time in the semester, to present their projects to the general public. "My favorite part of Imagine by far is walking up to an exhibit and watching how great our students present themselves and how they have learned to vary their abilities to speak at different levels," said Culhane. "If they have kids there, they will change their presentation to allow those kids to understand it." 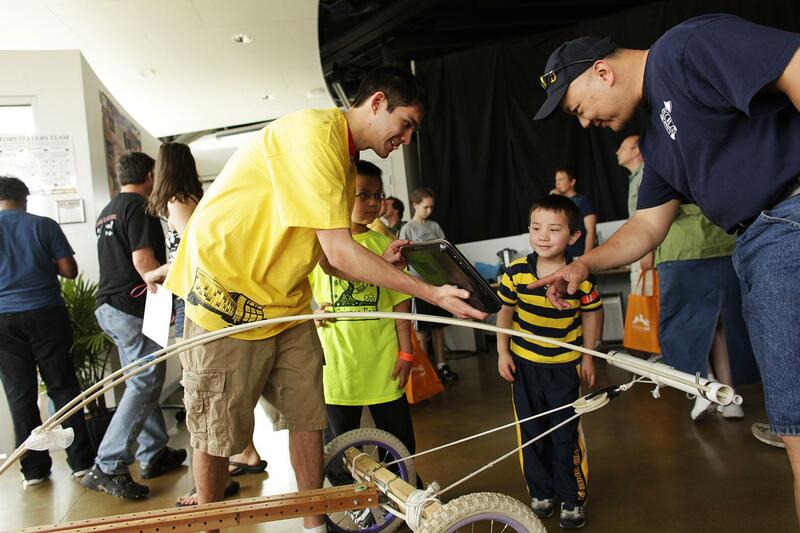 Imagine RIT is very friendly for kids, and many people find showcasing their projects to children is very rewarding. "I think it's a great event for kids because they can come and they can look at all these different things, whether its engineering, or they go into one of the art buildings," said Babul. "It helps them figure out what they're interested in." Babul emphasized that Hot Wheelz showcases their projects to encourage young people to pursue STEM and to show young girls that an all-female team can build a racecar. Williamson said that E-House always tries to include at least one kid-friendly project. This year, they built a 3D printed puzzle with their on-floor 3D printer; it will be located in Erdle Commons in the Gleason building. 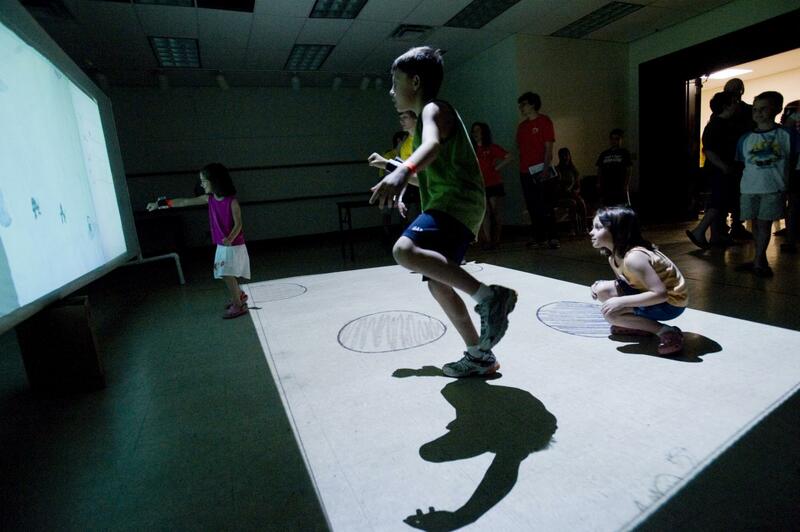 A Tesla Turbine and arcade machine built by E-House will also be displayed in Erdle Commons. They have also built a wooden car that will be displayed outside ENT in the "Technology Quarter." Culhane assures us that the incoming president, Dr. Dave Munson, plans to continue putting on Imagine RIT. Planning for Imagine RIT 2018 has already begun. The date has been set for April 28, the earliest it will have been held, to accomodate the new academic calendar. To begin planning for the next year, the committee debriefs on the current year. "After the festival we also put out a survey to visitors, volunteers and exhibitors so in addition to feedback during debriefing, we analyze the results from the survey and then I usually write up a little report and it's from that that we develop our plan of work moving into the following year," said Heather Cottone, chair of program and logistics for Imagine RIT. Representatives from each college also share what happened in their areas, what went well and what could have gone better. The committee attempts to use this feedback to improve future events. For instance, they have been trying to implement an app that will work in real-time to help visitors find their way around the fair. One issue that they have to deal with is ensuring that the golf carts reserved for disabled attendees to use are not being used as "joyrides" for kids. On July 1, the beginning of RIT's fiscal year, the Imagine RIT committee starts talking about Destler's challenge, plans meetings for the following year and announces the "save the date." On January 1, marketing starts up and things pick up the pace until everything comes together. "There's a lot of little detail stuff that needs to be sequenced perfectly to all come together on one day," said Culhane. Culhane and Cottone say that Imagine RIT attracts many future RIT students. "From black hole research to beautiful artwork ... to electrical engineering to all kinds of sciences." "[The students] couldn't believe all the different stuff," said Culhane. "From black hole research to beautiful artwork... to electrical engineering to all kinds of sciences." Rahrle agreed with this. "There are families that go to Imagine because they want to see what RIT is like before their child goes there," she said. "I think that having things that are not just hands-on is really good for people to understand that you can get more involved than what you're going to school for." Imagine RIT has something for everyone and it's an experience that is unique to RIT. Nobody can see it all in one day, but be sure to check out "Reporter Through the Ages" in the Student Alumni Union! "It's the joy on the children's faces as they run through the [ooblek] and they see the robot move ... All these things for them are 'space-like.'" — Dr. Barry Culhane, festival chairman. "I think it's about showcasing RIT. We're not just a tech school, we have other things going on." — Jenna Rahrle, music director for POP. "We have performances and food ... There's something for everyone, which I think is really great." — Scott Williamson, Imagine RIT coordinator for Engineering House. "I think it's a way to give back to the community and a way for the community to participate with RIT." — Caitlin Babul, chief electrical engineer for Hot Wheelz.